A team of researchers from Ben-Gurion University in Israel has discovered a way to extract sensitive information from air-gapped computers – this time using radio frequency transmissions from USB connectors without any need of specialized hardware mounted on the USB. Dubbed USBee, the attack is a significant improvement over the NSA-made USB exfiltrator called CottonMouth that was mentioned in a document leaked by former NSA employee Edward Snowden. Must Read: BadUSB Code Released – Turn USB Drives Into Undetectable CyberWeapons. Moreover, USBee does not involve any implant in USB firmware and drivers to execute the attack. "We introduce a software-only method for short-range data exfiltration using electromagnetic emissions from a USB dongle," researchers wrote in a research paper published Monday. "Unlike other methods, our method doesn’t require any [RF] transmitting hardware since it uses the USB’s internal data bus." The researchers stress the attack method of USBee is solely based on software, though it has to met certain conditions to execute. They are:The protected computer must be infected with the malware, most probably, with the help of an insider. USBee turns the targeted computer’s USB ports into mini Radio Frequency (RF) transmitters by modulating the data fed at high-speed to plugged-in devices. 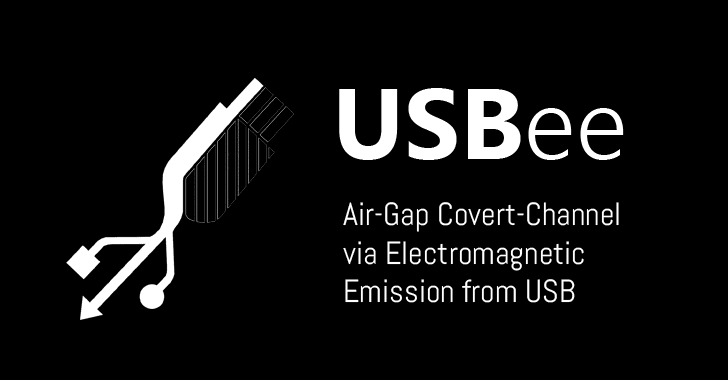 USBee will then send a string of ‘0’ bits to a USB port in such a way that makes the device generate detectable emissions between 240MHz and 480MHz frequencies, according to Mordechai Guri, one of the researchers. Now, by writing sequences of ‘0’ and ‘1’, attackers can generate a carrier wave from the rapid voltage changes and then use binary frequency shift keying (B-FSK) to encode useful data. Since the attack is meant to steal binary data, attackers wouldn’t be able to steal any large files, but could get their hands on keys, passwords, and other small bits of sensitive data stored on the targeted computer. USBee transmits data at about 80 bytes per second, which is fast enough to steal a 4096-bit decryption key in less 10 seconds. The USBee malware offers ranges of around 9 feet when data is beamed over a USB thumb drive to 26 feet when the USB device uses a short cable that acts as a transmitting antenna. The researchers’ attack method sounds really impressive, but it’s still a theoretical attack that can be deployed in real-world scenarios and be effective.